The crime of Aggravated Assault and Battery is a variation of “simple” assault and battery. By the way, “simple” assault and Battery doesn’t mean it isn’t a serious crime; it just means that there are no additional elements that would elevate the charges to one of several other forms of Assault and Battery, which are listed on our main Assault and Battery Page on this website. The statutory offense of Aggravated Assault & Battery falls under Chapter 265 Section 13A of the Massachusetts General Laws. Aggravated Assault and Battery is a felony offense, which means that punishment can include a state prison sentence – unlike a sentence to a County Jail/House of Correction. County Jail sentences are typically no longer than 2 ½ years, and inmates there are generally imprisoned for more minor offenses. State prison is very different: Sentences there are longer than 2 ½ years, the inmates housed there are generally being incarcerated for very violent offenses, and the environment is very severe. Aggravated Assault & Battery differs from “simple” Assault or Assault and Battery, in that additional elements are present which make the crime more serious. Since you’re reading this page, it may be that you have already been arrested for this offense, or fear that you are being investigated by policer and that you might be arrested in the near future. Either way, click on the “Free Arrest Tip Sheet” to the left of this page, to download a FREE list of tips on how to handle the immediate aftermath of an arrest in Massachusetts. Serious bodily injury was caused to the victim. 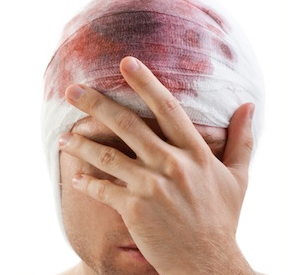 “Serious bodily injury” is defined legally as an injury that resulted in permanent bodily disfigurement, loss or impairment of a bodily function or organ, or an injury that posed a substantial risk of death. Or, the defendant knew or had reason to know that an abuse prevention order or a harassment prevention order had been issued against him or her in favor of the victim. When one of these elements exists, the crime is elevated to Aggravated Assault and Battery, and as a result, the punishment is more severe than “simple” assault: A defendant who is convicted of the felony charge of Aggravated Assault and Battery faces a maximum state prison sentence of 5 years, or alternatively a maximum of 2 ½ years in a County Jail/House of Correction, and/or a maximum fine of $5,000.00. As you can see, this is no small crime in Massachusetts. Self Defense. Very briefly, a person is allowed to act in self-defense, but must do so “reasonably,” which depends on case law. Defense of Another. Generally speaking, a person may use that amount of force to protect another, which he would have been allowed to use to protect himself. Click on our Assault and Battery Overview Page for more detailed examples of these defenses. WHY HIRE THE LAW FIRM OF WILLIAM D. KICKHAM AND ASSOCIATES TO DEFEND YOUR AGGRAVATED ASSAULT AND BATTERY CHARGE? A good question. While we could go on and on about our 25 years of experience producing superior results for our criminal defense clients, maybe we can answer the question best by quoting a phrase that a lot of our clients told us described their experience with us defending them: “We Don’t Just Represent You – We Rescue You.” Our firm assembles veteran, experienced criminal defense lawyers, headed by Attorney William D. Kickham, on behalf of each and every client. Our Boston and Westwood, Massachusetts Assault & Battery Defense Attorneys know that to be charged with a crime like this can be a harrowing personal experience. We know how to guide you through it, and we know how to win in a courtroom. When we stand in front of you as your attorney, you’re going protected by a legal bodyguard. And you’re going to know it. Don’t make a serious mistake in who you choose as your defense attorney. We know how to very aggressively and successfully defend charges of Aggravated Assault and Battery and we know how to make sure you are legally protected to the maximum extent possible. We have been very successful in either dismissing these charges or in reducing the charges to eliminate the exposure to a state prison sentence. When that is not advisable, we take our cases to a jury, and our track record speaks for itself. Call us 24 hours a day, seven days a week at Ph. : (781) 320-0062, or at Ph. : (617) 285-3600, or contact us online here for a free initial consultation. Westwood and Boston, Massachusetts criminal defense lawyer William D. Kickham has appeared as a legal analyst on a variety of respected media, including Court TV, Fox News TV-25/Boston, The Boston Herald, WBZ-AM Radio 1030, WCVB-TV5/Boston, Nightside With Dan Rea, Greater Boston With Emily Rooney, Money Matters Radio/Boston, and The Metro Newspaper/Boston. Attorney William D. Kickham is turned to by respected reporters and media organizations in Massachusetts as an authoritative expert in the field of criminal defense law, and the case results he produces for his clients attest to this. For more information on Attorney William D. Kickham’s professional biography, click here. Call us today at Ph. : (781) 320-0062, or Ph. : (617) 285-3600, to arrange for a free initial consultation of your case. If the matter is not an emergency, you can email us here for a free initial consult and we will respond to you very promptly.